Today I am reviewing the Meyin RF-604, a cheap 2.4GHz flash triggering system that features compatibility with the popular Yongnuo RF-602. The last occasion a Chinese company made a radio trigger that worked with another brand, it didn’t end that well. Here’s hoping this time will be different! Before we get into that, an overview: Meyin is one of the brands produced by Rikon, a Hong Kong-based firm that is also behind the Dazzne Kody TTL triggers. While the Dazzne brand is reserved for high-end gear, Meyin aims to be more budget-friendly. Which brings us to their new radio slave. 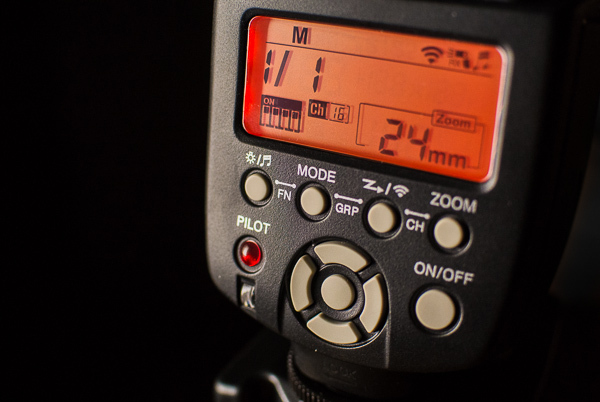 Unlike the Kody TTL, Phottix Odin and Pixel King II, the Meyin RF-604 strips out fancy LCD screens, advanced remote control and automatic exposure metering, instead giving the user a back-to-basics flash trigger. It is designed to synchronise external flashes with a camera over distances up to 100 metres, all in manual mode. 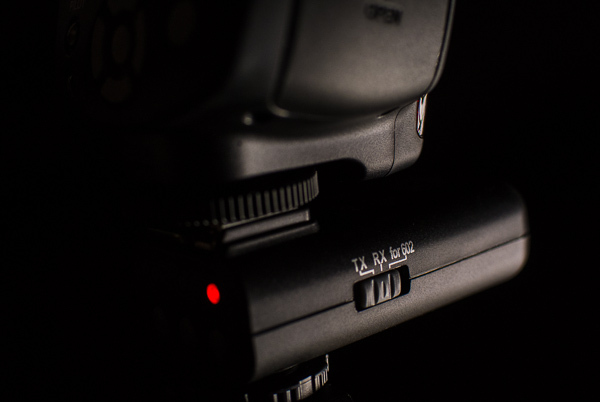 There are a couple of perks such as the ability to ‘wake up’ shoe-mount flashguns from standby mode and a wireless grouping feature that allows photographer to use any combination of off-camera lights in groups A, B and C.
Out of the box, the RF-604’s design looks like it was heavily inspired by the Phottix Strato II Multi, a (more expensive ) competitor with the same kind of grouping ability. There are some key differences though: the RF-604 is ‘transceiver’-based, meaning that each and every unit can behave as either a transmitter (‘TX’) or a receiver (‘RX’) at the flick of a switch, whereas the Strato II comprises dedicated transmitters and receivers. The Strato II also has four groups, versus the RF-604’s three. The RF-604 feels well put-together. By no means bomb-proof, the switches and buttons might not last forever but they do the job. In general, the controls seem sensibly laid-out and everything is intuitive, which is just as well because there is no instruction manual in the box (or not in our sample anyway). In my opinion, grouping is a must-have in any trigger. 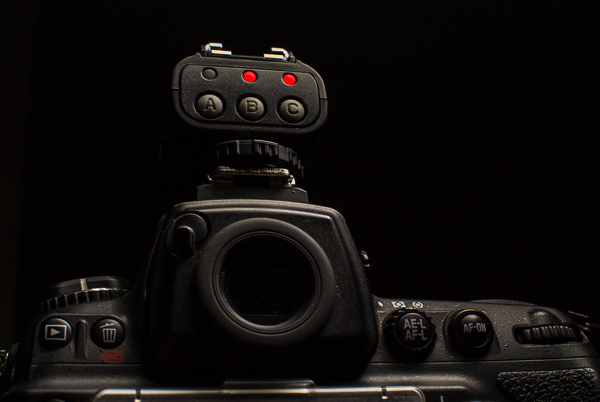 It enables the photographer to switch between several different potential lighting setups without leaving the camera position, which can be handy at fast-paced weddings and events. 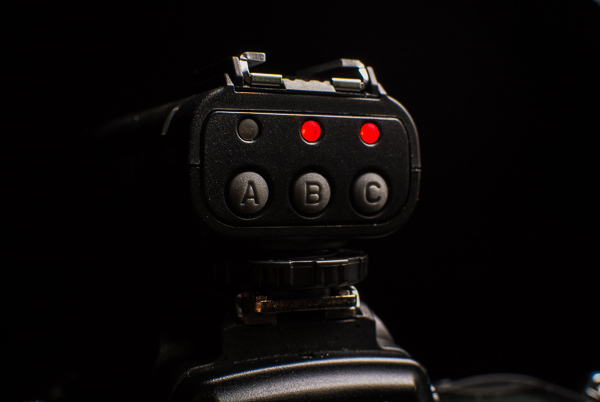 In the studio, assign the key, fill and separation lights to different groups and then you can meter them separately or (especially useful for educators) demonstrate the effect of adding and removing each one from the photograph. It is by no means a feature exclusive to Meyin, as you will find similar functionality in the aforementioned Phottix Strato II, Aputure Trigmaster Plus II, Pixel Opas and PocketWizard Plus III (where it is called ‘Quad-Zone’ triggering). Each of these has four groups (over the Meyin’s three) so there are even more possible combinations. 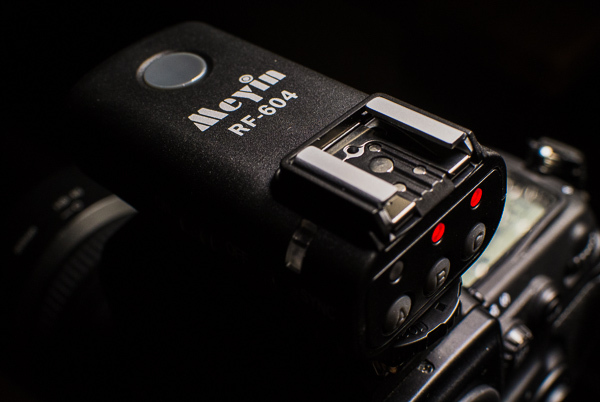 The easiest way to connect an external flash to the Meyin RF-604 system is to slide it into the hotshoe and flick the mode switch to ‘RX’. In the case of studio lights, connect them to the 3.5mm ‘SYNC’ port. The receiver is easily strong enough to support the weight of even the beefiest flashguns. Checking the wireless connection is easy thanks to the dedicated test button and blinking status LEDs. Annoyingly, these indicators have limited viewing angle and are only really easy to see from above, when typically your lights will be overhead on a light stand or boom. Mounting the RF-604 somewhere off-camera may be a bit of headache if you are not already kitted out. Rikon does not include any coldshoe clamps or tabletop flash stands with the RF-604, which means you will probably have to buy some separately if you want to be able to set up a shoe-mount flash on a table, shelf, light stand or tripod without it falling off. However these are very easy to come by: many light stands brackets have clamps already, and tabletop stands often come packaged with flashes. I have been impressed with the performance of the RF-604. Even at very close ranges the trigger never fails, which is more than can be said for the Cactus V5. Using a focal-plane shutter on the Nikon D700 DSLR camera, it is possible to shoot at shutter speeds as fast as 1/250 second, which is the maximum sync speed of this camera. Any faster than this and black bars start to appear in photographs, as with all other manual triggers. There is something missing from this system though. Nearly every other trigger has it as standard: user-selectable channels. It turns out, the Meyin just does not have any. Look all over this device for some Dip switches — you will not find them. Woe betide you if this product becomes popular, because apart from shooting separately on groups A/B/C, there is no way for multiple photographers to use these triggers within 100 metres of each other without accidentally setting off each other’s flash units. Now, what about that cross-compatibility with the Yongnuo RF-602? That only works on Yongnuo’s channel 16 (on the 602s, this means all the Dip switches in the ‘ON’ position) and Meyin groups are disabled as soon as you switch the RF-604 to “for 602” mode. On the plus side, it does work, and works well. 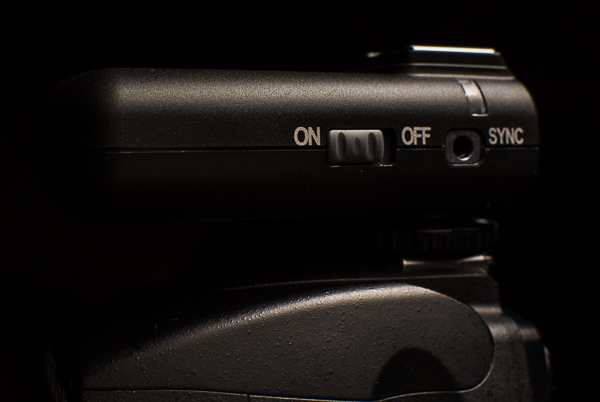 If you never really change your channels then you could dispense with your RF-602TXes (which use odd CR2 batteries) and use an RF-604 (with AAAs) on your camera instead. 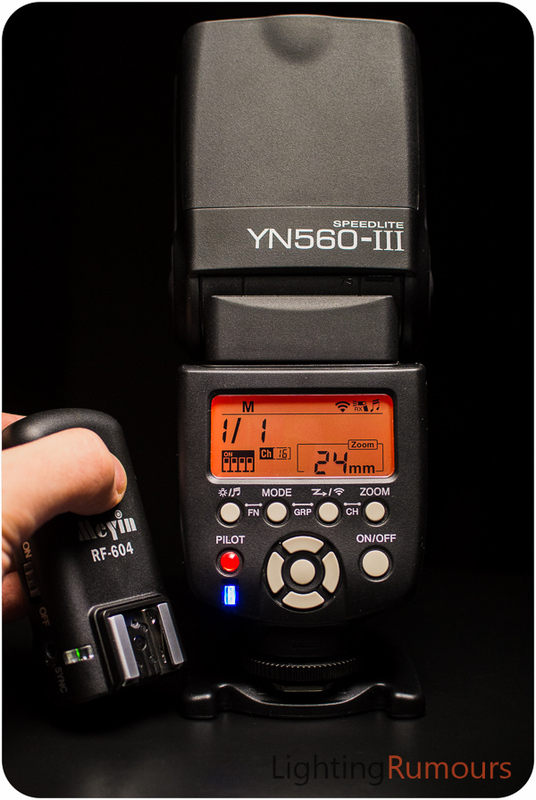 One of the other rewards of such inter-brand compatibility is that, since the Yongnuo YN560-III flashgun is made with an RF-602RX receiver buried inside it, the MeYin RF-604 can trigger the flash without directly connecting any units to the body of the flashgun itself. Granted, this only works on one channel without groups, but one light is all some folk need. Ask Zack Arias. Tip: To get the Yongnuo YN560-III on the right channel, use the ‘FN’ buttons to switch it to RF-602 mode, then hold the ‘CH’ buttons and adjust the skeuomorphic on-screen Dip switches to the configuration shown in the photos on this page (above; below). If the blue light comes on then it means the flash is communicating. 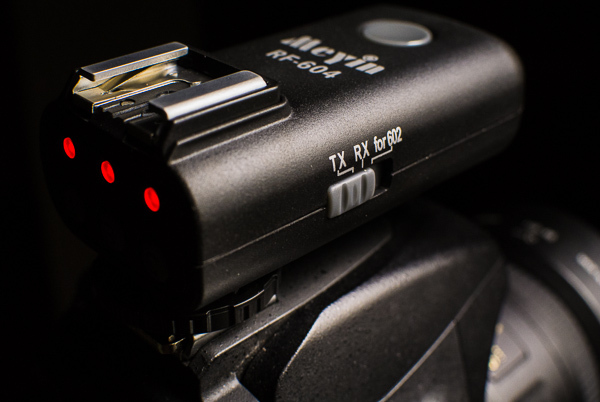 The Meyin RF-604 is a well-made all-round 2.4GHz flash trigger with decent performance, but it is not for everybody. The grouping feature, ostensibly a handy addition, is actually the only way of keeping interference at bay due to the shortage of different frequency channels. This means the system is not well-suited for educators in lighting workshops, unless everybody there wants to be sharing the same flashes. For home enthusiasts, private location shoots and small studio use however they should do the job nicely, especially for the low price. Compatibility with Yongnuo RF-602s is unique. So long as you are a fan of channel 16, if you are a Yongnuo RF-602 user then an RF-604 is a good choice replacement transmitter, saving you the trouble of sourcing CR2 batteries for the RF-602TX. Moreover, anybody desperate for wireless flash grouping but unwilling to shell out for the Phottix Strato II Multi or Pixel Rook could do well by the budget-friendly Meyin RF-604. The Meyin RF-604 comes in versions for Nikon and Canon, both available now for around $40 per pair on eBay and at EachShot. Are you interested in this product? Leave your comments below.